Garver congratulates Kerrville Municipal/Louis Schreiner Field Airport in Kerrville, Texas for its recent recognition as the General Aviation Airport of the Year by the Texas Department of Transportation Aviation Division. The airport has made many improvements over the last 10 years. This includes constructing a new security fence and terminal building and relocating taxiways and an entrance road to accommodate larger aircraft. Since 2009, airfield operations have shown a marked increase and now average 60,000 a year. 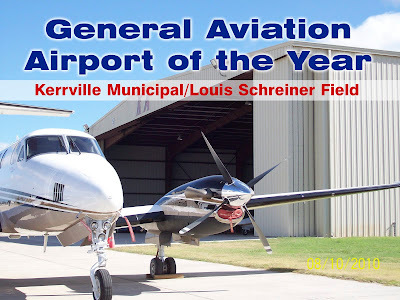 "Kerrville Municipal/Louis Schreiner Field Airport enjoys the benefits of excellent infrastructure, a supportive community, and a capable management board and airport director, and its many contributions to the local economy make it a truly fitting choice for this prestigious award," the Texas House Resolution stated. Garver is currently providing services to Kerrville to update the Airport Master Plan with an emphasis on terminal area development and alternatives, marketing planning, financial planning, and economic impacts. The master plan update is an integral tool in determining and siting future facility development.